Siri hasn't been perfect to this point, but Apple has added some pretty awesome new worlds to ask her about: Sports, restaurants, movies. Pretty much enough to plan a whole date right through Siri. Here's the laundry list: You can ask about the scores of live games—"What's the score of the Giants game? "—or about individual player stats. You can also make OpenTable reservations, get Yelp scores, ask about what movies are playing at a local theater and then see a trailer. If you're busy and can't take a call, you can ask Siri to remind you to call the person back later. This is the kind of useful, everyday thing that voice commands can actually be super useful for. Siri can also launch apps now too. For example, you can ask her to play a movie, and up pops the video-playing app. Facebook especially is pretty deeply integrated into Siri, so you can just ask it to post photos to Facebook. Another cool thing is eyes-free integration for cars. Siri will stop the phone from lighting up, so it won't distract you while you're driving. If Siri's actually working well this time around, it'll be a pretty good addition. 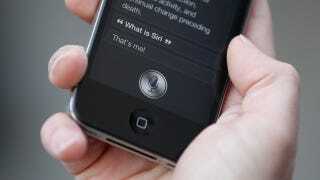 Siri can offer directions and monitor traffic along the way. Set a destination, tap the route button, and it spits out an ETA based on the gridlock on the ground. If it's too slow, Siri starts looking for a re-route. If the phone is plugged into your car, this can work from the lock screen. That actually sounds pretty cool. Just with the obvious Siri criterion: If it actually works.